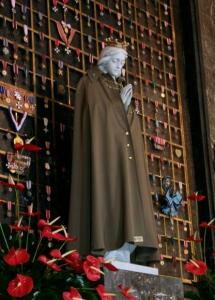 On Independence Day 2010 the statue of the Virgin in the Military Cathedral wore the coat of an officer of the Border Guard. The collapsing Communist regime agreed in 1989 to again allow chaplains into the armed forces. On 21 January 1991 John Paul II revived the military ordinariate which includes the troops of the Border Guard  and the draft concordat of that year appears to refer to an agreement already made between the Church and military. (Article 10.1) In 1993 a special decanate for the border Guard was created within the military ordinariate. This agreement is the fourth made between the Church and the Border Guard (§ 12) Bishop-General Tadeusz Płoski who signed this agreement was among the notables killed in the 2010 Smolensk plane crash. This pact stipulates that the Church chooses and the state pays: military chaplains are hired and fired by Bishop-General Ploski (§ 4.2), but their salaries as officers in the Border Guard are footed by the taxpayer (§6). The chaplaincy is fully integrated with the military, so that chaplains possess both ecclesiastical and military titles, as in "Father Monsignor Kazimierz Colonel Doctor Tuszynski, Dean of the Border Guard". Official equivalencies between the two sorts of titles mean that — a Chaplain is a Lieutenant-colonel (Podpułkownik), a Dean is a Colonel (Pułkownik) and a Bishop is a General (Generał). This ranking system also means that, as a Major General (Generał dywizji), Bishop Tadeusz Płoski outranked Brigadier General (Generał brygady) Mirosław Kuśmierczak, the Chief Commandant of the Border Guard — who theoretically should salute Bishop Płoski. In addition to all this — in a symbolic, but fervently asserted sense — the Most Holy Mother of God is the Commander-in-Chief (Hetmanka). There is also now a chaplain in the Polish Internal Security Service (ABW). Only under repeated questioning did the politically tainted and scandal-plagued secret service reveal that on 18 March 2009 it had appointed as chaplain, Father ABW Commander Dr. Leon Szot. An experienced counterintelligence officer who did not want to be named, expressed doubts about the provison of a chaplain to provide "confession and absolution" for moral transgressions committed in the course of their work. This was an important function of the military chaplains under the 1957 Argentine military concordat. — [receive] logistic support for conducting pastoral activities. 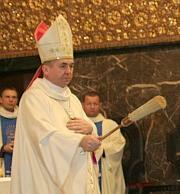 Bishop-General Tadeusz Płoski uses an aspergill to sprinkle holy water on a flag. As the commander of an army division he outranks the other signatory of this agreement, the head of the Border Guard, who only commands a brigade. 1. The Parties act within their competence arising from separate legal systems [i.e., civil and Canon Law]. 2. The agreement does not affect the jurisdiction of the Field Bishop of the Polish Armed Forces arising from Canon Law, or the statutory jurisdiction of the Commander-in-Chief of Border Guard. 3. The Field Ordinariate of the Polish Army carries out pastoral duties in the Border Guard as prescribed for it under Church Law. 1. In order to ensure proper implementation of pastoral activities in the Border Guard, pursuant to the provisions of Canon Law, there will be established a deanery, parishes pastoral centres in branches and training centres of the Border Guard. 2. The Dean of the Border Guard is head of the deanery of the Border Guard. 3. 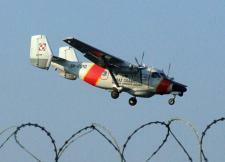 The pastoral ministry of the Border Guard is served by chaplains of the Border Guard in parishes and pastoral centres. 3. Between head of a unit of the Border Guard Headquarters and the Dean of the Border Guard and chaplains. Masses are held for soldiers killed in helicopter crashes while patrolling the border. The patron of the Border Guard is St. Matthew (who outdid St. George by subduing two dragons*). Every September 21st the chaplains of the Border Guard hold celebrations in his honour. 1. The Dean and chaplains of the Border Guard are officers of the Border Guard. 2. Pursuant to the provisions of Canon Law, the Field Bishop of the Polish Army has the right to request from the Commander in Chief of the Border Guard appointments and dismissals of the Dean and chaplains of the Border Guard. 3. Regarding working methods and the selection of pastoral activities, the Field Ordinariate of the Polish Army is independent. 4. The scope of responsibilities of the Dean of the Border Guard is subject to approval of the Commander-in-Chief of the Border Guard. 5. The Field Bishop of the Polish Army appoints the chaplains and the Dean of the Border Guard to carry out pastoral duties by a decree, an example of which is annexed to this Agreement. The Field Bishop of the Polish Army will inform the Commander-in-Chief of the Border Guard of the appointments. 1. The Commander-in-Chief of the Border Guard is the disciplinary superior of the Dean and chaplains of the Border Guard to the extent specified in the Statute on the Border Guard and the executory provisions. 2. Regarding the matter of compliance with the terms of their pastoral service, the Field Bishop of the Polish Army is the disciplinary superior of the Dean and chaplains of the Border Guard. The pay grade, awards and promotion to higher military rank of the Dean and chaplains of the Border Guard shall be in accordance with the Statute on the Border Guard. In making awards and granting promotions, consideration shall be taken of the views of the Field Bishop of the Polish Army. 1. Take the necessary steps to ensure proper conditions for the implementation by the Dean and chaplains of the ministry and religious practices and for the use of this service by officers and employees of the various organisational units of the Border Guard. c) participation in services and patriotic and religious ceremonies. 3. Create for the Dean and chaplains of the Border Guard optimal conditions for performing pastoral duties, and solicit their opinions about organising religious service. 4. Ensure the participation of the Dean and chaplains in meetings and briefings on discipline and interpersonal relations, and inform them of any problems occurring in that area. 5. Enable the Dean and chaplains to shape, within the environment of the Border Guard officers, desirable moral, civic, patriotic and religious attitudes. 6. Ensure, together with the Dean and chaplains, optimal realisation of the tasks and projects arising from the annual pastoral plan. 7. Include within the training program classes in normative ethics. For the purpose of the pastoral ministry in the Border Guard units, where possible churches, chapels or prayer rooms shall be set up with the appropriate logistic support, in accordance with the liturgical requirements, having complied with the requirements of civil law, in particular building regulations and public finance law. 1. The Dean and chaplains of the Border Guard are allocated fully-equipped offices in the Headquarters of the Border Guard and training centres. 2. The allocation of buildings and premises to the deanery, parishes and pastoral centres of the Border Guard, and the provision of transport is carried out in accordance with the regulations in force within the Border Guard. In exceptional circumstances religious services are organised by the Dean and chaplains of the Border Guard in a place specified by a competent commander in the area of operations of the Border Guard officers. At the beginning of each calendar year the Commander-in-Chief of the Border Guard and the Field Bishop of the Polish Army will assess the requirements for pastoral activity in the Border Guard and set objectives for the current year. They will set the schedule of meetings at their discretion. Agreement No. 3 between the Commander-in-Chief of Border Guard and Field Bishop of the Polish Army on the organisation of the Catholic ministry in the Border Guard, signed on 10 March 1995 in Warsaw, shall expire. The present Agreement shall enter into force upon signature. the agreement was signed in the presence of Minister of Defence Aleksander Szczygło and Deputy Minister of Defence Jacek Kotas as well as other officers who had come for an indulgence to the Military Cathedral of Polish Army and Flag Day [2nd of May]. 1. “Law on the relationship between the State and the Catholic Church in the People's Republic of Poland”, 1989, one of Rakowski’s “May Laws” . “80 Rocznica powstania Straży Granicznej z posługą duszpasterską wśród funkcjonariuszy i pracowników” (80th Anniversary of the founding of the Border Guard with the pastoral ministry among the officers and staff), 10 May 2006.